The rapid development of green energy technologies, often supported by local and national government policies, has resulted in solar power applications and solutions quickly coming online throughout the world. One such solution, known as Concentric Solar Power (CSP), is a thermal storage system that compensates for variations in the supply of solar energy over a single day. As a result, this system continues to generate electricity and supply power during cloudy or rainy days as well as during the nighttime. Implementation costs, product lifespan, and energy storage efficiency levels are superior to rival technologies, giving CSP the potential to be a green energy application that operates stably and continuously around the clock while supplying low-cost electricity. 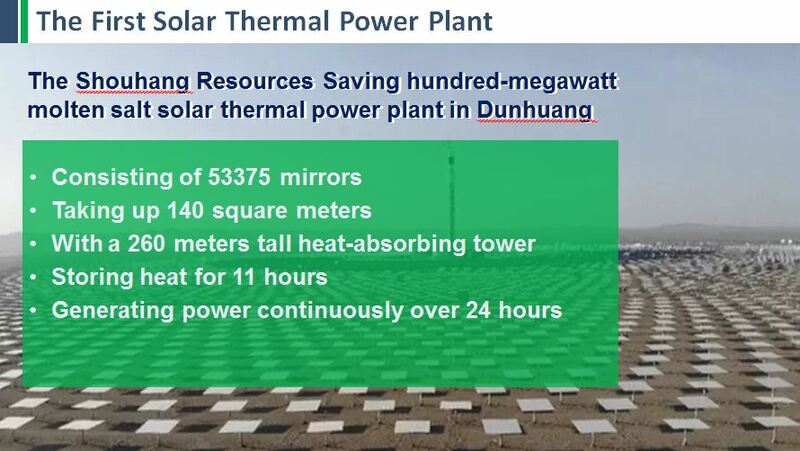 The Shouhang Resources Saving hundred-megawatt molten salt solar thermal power plant in Dunhuang is the first molten salt solar thermal power plant in Asia that can generate power continuously over 24 hours. 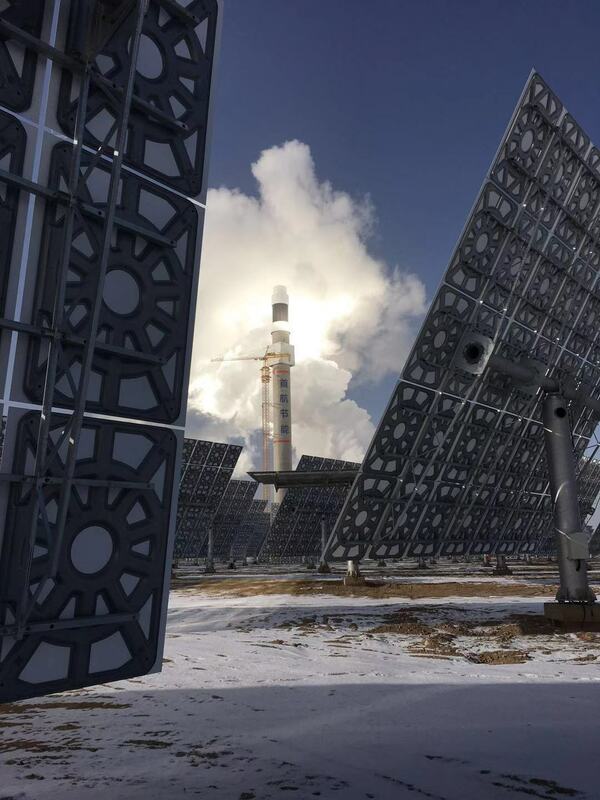 China’s First “Hundred Megawatt Solar Thermal Power Plant Operation Result Release” Conference was jointly held by the People’s Government of the City of Dunhuang, Beijing Shouhang Ihw Resources Saving Technology Co., Ltd. and CSPPLAZA Solar Thermal Power Generation Network on December 28, 2018. During the conference, the vice president of Shouhang Resources Saving, Huang Wenbo, detailed the results of the on-grid operation of the power plant and shared his experiences regarding construction, debugging, operation, and maintenance. The plant is located in the Solar Thermal Park in Qili Town, Dunhuang City and takes up 800 hectares. 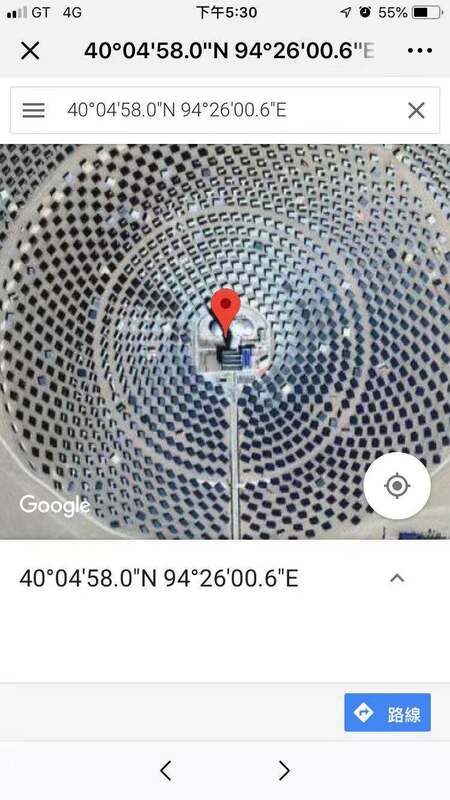 One special feature is the facility’s use of mirrors: Taking up 140 square meters, there are 1525 heliostats, consisting of 53375 mirrors, arranged in a circular configuration around the heat-absorbing tower which can be seen on the Google satellite positioning map. The heat-absorbing tower located near the center of the site is 260 meters tall. It is Asia’s tallest heat-absorbing tower for solar thermal power plants. Using 100% solar energy, it delivers new energy generation without causing environmental pollution. The project uses a total of 5800 tons of molten salt as a medium for heat absorption, storage, and exchange. It can generate electricity for 15 hours without light. This project was independently designed and developed by Shouhang Resources Saving. The solar thermal power generator utilizes reflectors to concentrate the sunlight on top of a tall tower. It then uses heated molten salt to create steam which drives the turbine to generate electrical power. 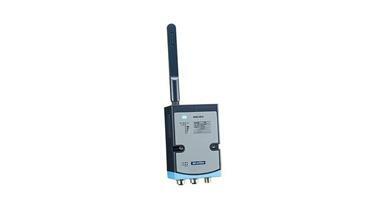 Key to the operation is a stable and reliable network structure. Therefore the solar thermal power technology company not only required a highly stable network solution to transmit control instructions, but also demanded network equipment with backup and management functions to ensure uninterrupted command and control. 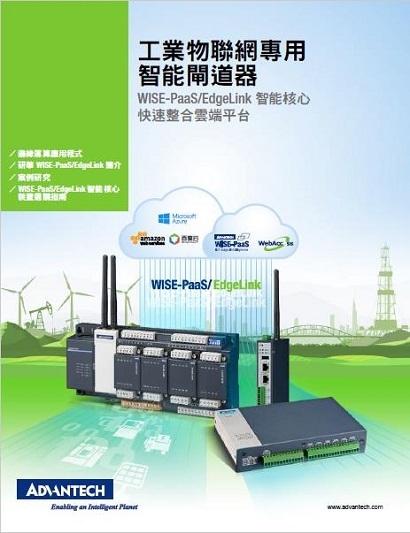 Because it offers EKI-series managed switches and WebAccess/NMS network management software, Shouhang Resources Saving chose Advantech’s hardware/software integrated solution to provide a stable and reliable network transmission for the Dunhuang plant. 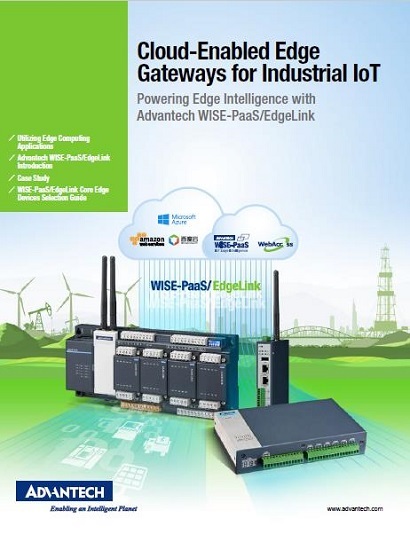 With redundancy and intelligent management, operators can monitor network connectivity in real time, remotely control network devices, and view all power generation information to ensure efficient and sustainable operation of solar thermal power stations under any conditions. The control center sends instructions to the heliostats arranged in a circular configuration around the tower. By angling the mirrors according to the sun's movement, they can fully absorb the maximum amount of solar energy. This is the China’s first hundred-megawatt commercial solar thermal power plant put into operation. With an annual power generation capacity is 390 million kwh, it reduces carbon dioxide emission by 350 thousand tons per year; equivalent to 10 thousand acres of forestation for environmental protection benefit. The successful launch of Shouhang’s project sets a new milestone in the development history of the domestic CSP industry and has greatly boosted confidence in developing the country’s first CSP demonstration projects. 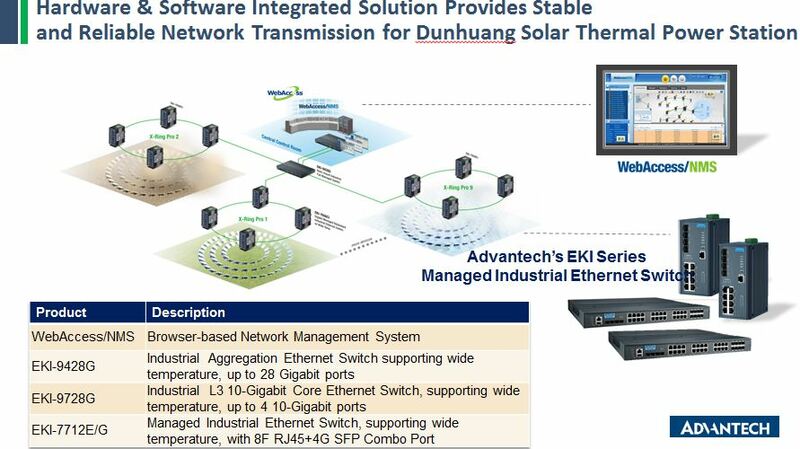 When it comes to a solar power station in the desert area of Dunhuang or other harsh environment applications, Advantech's one-stop hardware and software integrated network solutions not only help save time and effort in building a stable network system, but also make monitoring a large number of devices easier through remote management. Working together, Advantech and Shouhang are excited to build a brighter future of new green energy!